The vision for proposed Leegate development, shown here looking to the southeast with Rt. 7 on the left and and Battlefield Parkway at the top. A proposed development at the intersection of East Market Street and Battlefield Parkway continues to await its fate, as the Town Council deferred action on the application last week. Developer Stanley Martin is requesting authority to build 430,000 square feet of office uses, 200,000 square feet of commercial uses, a 130-room hotel, two parking structures and 475 residential units—a combination of townhouses, two-over-two condominiums and multifamily units. The 77-acre development would be located at the southwest quadrant of the intersection, across from the Lowe’s. To move dirt on the project, the Town Council must first approve a rezoning, special exception and an amendment to the Town Plan, which designates the area for regional office uses. In its initial debate over the project, council members have wrestled with moving away from that Town Plan vision, and inserting more residential units into an area once viewed as an employment center. Other concerns have been voiced about the proposed phasing of the project, with the bulk of non-residential uses planned for later stages of the development, and the impact to local roads. While the applicant is proposing to build an extension of Russell Branch Parkway to link with Trailview Boulevard near Cardinal Park Drive, some council members have suggested the applicant should contribute more than just land reservation for the future Rt. 7/Battlefield Parkway interchange. 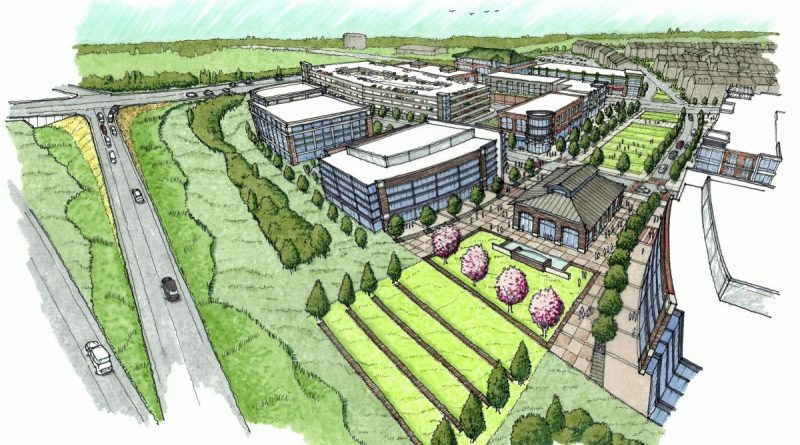 The applicant, represented by Cooley LLP, says the town will see a positive fiscal impact if the project is approved, and has pointed to other successful mixed-use developments that built rooftops before retail, restaurant and office uses, to generate immediate business for the non-residential uses once constructed. Ultimately, the council voted to postpone a vote on the project by two weeks. Councilwoman Suzanne Fox had initially proposed deferring the application until the council’s first meeting in January, but when there was clear resistance voiced by other council members, she said she was amenable to a two-week delay instead. The vote to defer passed by a 5-2 vote, with Mayor David Butler and Councilman Marty Martinez opposed.